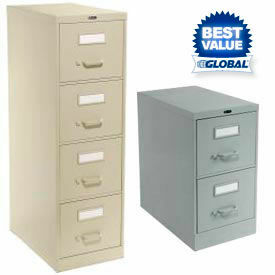 Global®- Vertical Files Keep Important Documents Neatly Integrated In Minimal Office Space. Global® Vertical File are made of heavy duty steel construction with corrosion resistant baked-on enamel finish for long lasting durability and dependability. Drawers that open and close easily with full extension cradle suspension and nylon rollers. High drawer sides eliminate the need for hang rails. Welded corners provide added strength and rigidity. Large label area on each drawer provides easy identification of contents. Meet ANSI/BIFMA and ISTA standards. Wide selection of space-saving 18 inch width, Legal Size, Letter Size or Vertical File type 2, 3, 4 or 5 drawer file units are available in 25 or 26-1/2 inch depths, 29, 40, 52, 64 and 64-1/4 inch heights and Black, Desert Putty, Gray, Light Gray and Putty color finishes. Lock Kits sold separately. Hirsh Industries® Vertical File Cabinets Are Designed For Intensive Home, Commercial Or Industrial Use. Hirsh Industries® Vertical File Cabinets are constructed of heavy duty steel for long lasting durability and dependability. 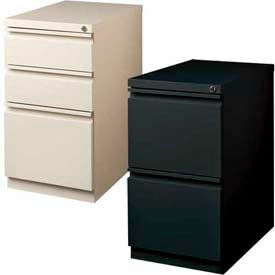 Commercial Grade quality cabinets have three-piece ball-bearing slide suspension that allows maximum drawer extension. Core-removable lock allows optional one-key convenience for multiple files. High-side drawers accept hanging file folders, eliminating the need for additional accessories. Sturdy aluminum handles and label holders. Baked-on enamel finish comes in Black, Putty or Light Gray color. 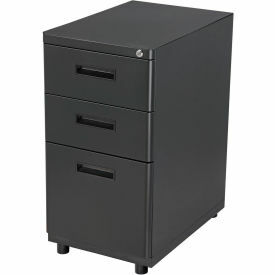 2 or 4 drawer units are availablle in various dimensions for Letter or Legal sized files. Meets or exceeds ANSI/BIMFA standards. Made from 33% post-consumer materials. Limited lifetime warranty. 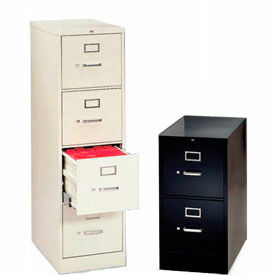 Hirsh Industries® Mobile Pedestal File Cabinets Are Designed For Versatile Use Under Standard Work Surfaces. Hirsh Industries® Mobile Pedestal File Cabinets are constructed of solid steel for long lasting durability and dependability. Designed to conveniently roll under most work surfaces. Telescoping, three-piece, ball-bearing suspension for easy file access. Core-removable lock allows optional one-key convenience for multiple files. Full width designer drawer pulls. High-side drawers accept hanging file folders. 27-3/4" height allows cabinet to fit under most standard work surfaces or to stand alone in work space. Hidden casters for a professional, integrated appearance. Counter weight inhibits tipping. Baked-on enamel finish comes in industry standard Black, Putty or Light Gray color. 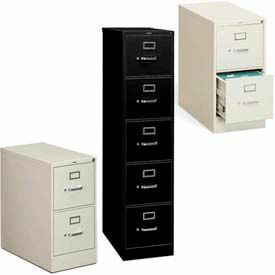 15" wide x 19-7/8" deep units are available with 2 file drawers or 1 file drawer with 2 box drawers. Meets or exceeds ANSI/BIMFA standards. Made from 33% post-consumer materials. Limited lifetime warranty. 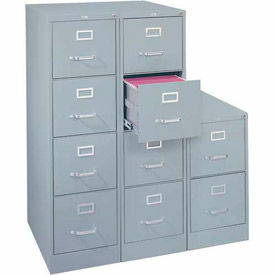 HON® File Cabinet Provides Secure Storage And Organization For Commercial And Industrial Applications. 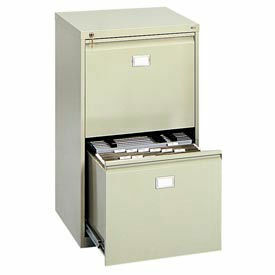 HON® File Cabinet is constructed from steel and treated with rust-inhibiting phosphate for long lasting durability. Commercial quality 310 Series vertical file offers flexible capacities in 2, 4 or 5-drawer options. Features include three-part telescoping and steel ball-bearing suspension. Aluminum drawer pulls, label holders and thumb latches provide practical organization and reliable craftsmanship. Standard interchangeable core removable locks and HON® "One Key" system ensure security. Includes HON® Full Lifetime Warranty. Available in Putty, Light Gray and Black,in heights of 29", 52" and 60". Get file drawer convenience. Constructed of heavy-duty steel, each drawer will hold twenty-four 18" Hanging Clamps (sold separately) or hanging file folders. Clamps and folders may be combined in the same drawer. Key lock included for protection of confidential information. Shipped ready to use.